Stores reference 12D/460. By Nestor. Approximately 6.5 x 3cm. Screw topped cylindrical aluminium container housing a second aluminium tube into which large-headed long burning matches were placed. The inner side of the outer container is coated with a special 'striking-surface'. Some of the original War Department broad arrow marked transfer printed label remains. 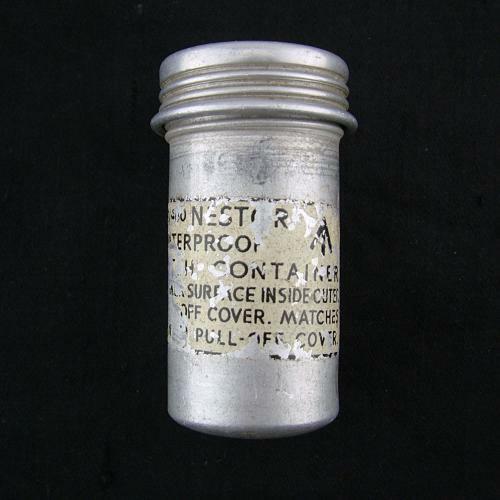 This reads '12D/460 NESTOR Waterproof Match Container - Striker Surface Inside Outer Screw Off Cover. Matches In Inner Pull-Off Cover'. These matchcases were issued for the 'Lightweight Flying Overall', better known as the Beadon flying suit, introduced to replace the Sidcot suit towards the end of WW2. Reasonable used condition although most of the 'striking-surface' has worn off. Empty. Quite a scarce item. Stock code S17753.